Though these projects can run largely independently of one another, there are some points of interaction. For example, it makes sense to weed the collections before applying RFID tags to all the books. The refurbishment of the lobby needs to fit around the RFID installation, as the carpet needs to come up and new cabling needs to be laid before the RFID gates can be installed. I started out by listing all the different stages that would be needed for each project, and began talking to other people who would be involved. This ended up being quite a lot of people: Intellident (our RFID system supplier); the team who support Oxford’s library catalogue (OLIS) regarding the RFID system; the security company who manage our CCTV; the college’s Estates team who will organise the electrician, carpenter, and redecoration aspects; a crate hire company for moving all the Law books; the college IT department for all the wiring, moving of computers and WiFi installation; suppliers for new furniture… I hope I haven’t forgotten anyone! I used Microsoft Project to begin weaving all these strands together: identifying predecessors (the order things need to be done), liaison, task durations, start and end dates and costs. I liked how Project allowed me to see different layers through the plan, e.g. 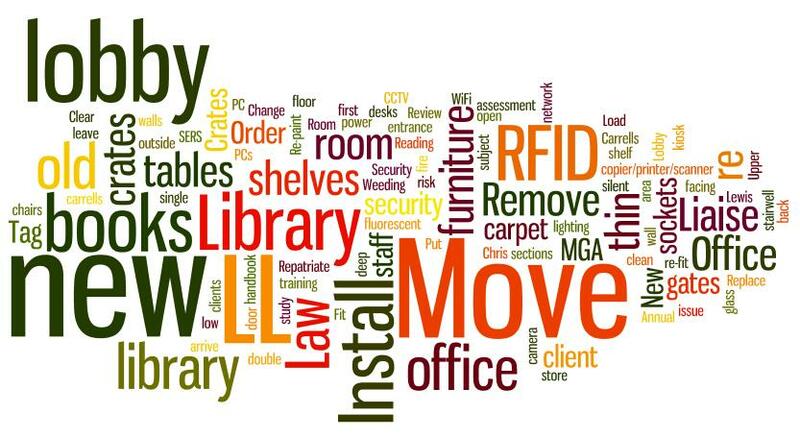 all the tasks that involved the IT team. 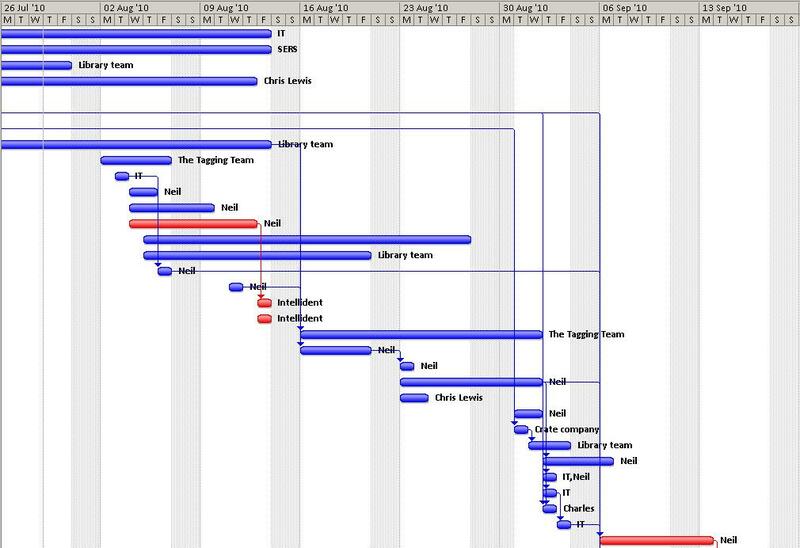 It also created a Gantt chart which helped me visualise the different phases of the work. The only problem with using Microsoft Project is that very few of my colleagues have the software on their machines, so they would not have been able to access my document. I worked around this by making an Excel version of the plan, once the details had been figured out. The work begins in earnest next week, and I’m looking forward to seeing all these changes taking shape. It will be great to welcome the students back in October with a improved library that offers them a better place to work. November 2010 update: find out how it turned out!